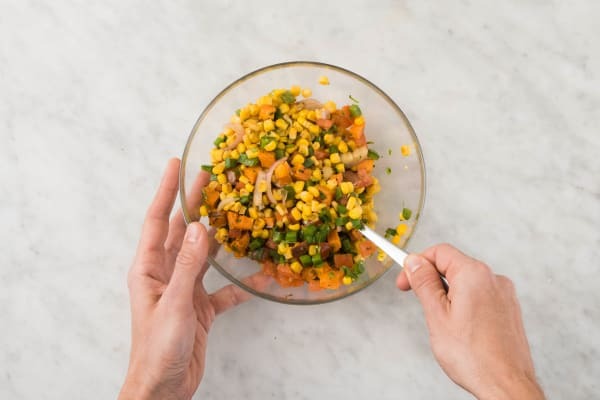 If this recipe were a person, it would be that buddy who is all smiles and pleasantness from Monday to Friday but a bit of a wild thing when the weekend rolls around. 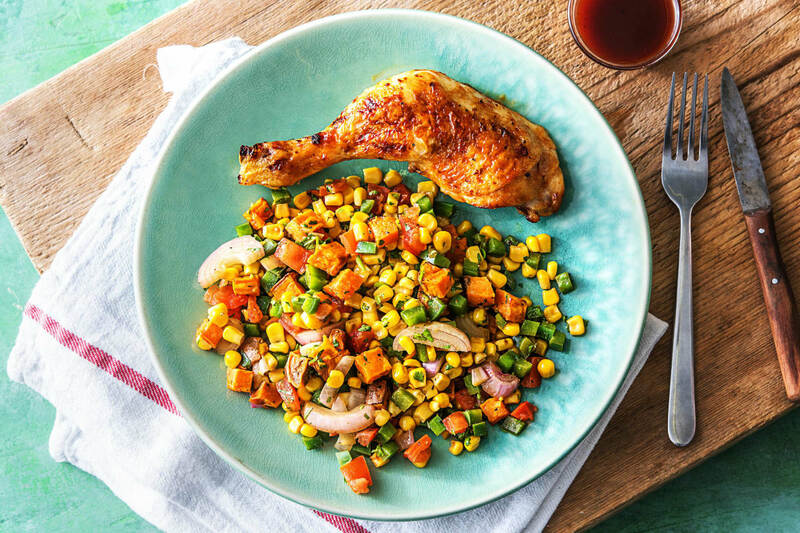 The crispy chicken and roasted sweet potatoes keep things tried-and-true, while the corn poblano salsa and spicy honey glaze are here to shake it up. But it doesn’t matter whether you’re a plain Jane or a feisty Frank—we think you’ll enjoy this dish either way. Wash and dry all produce. Adjust rack to upper position and preheat oven to 425 degrees. 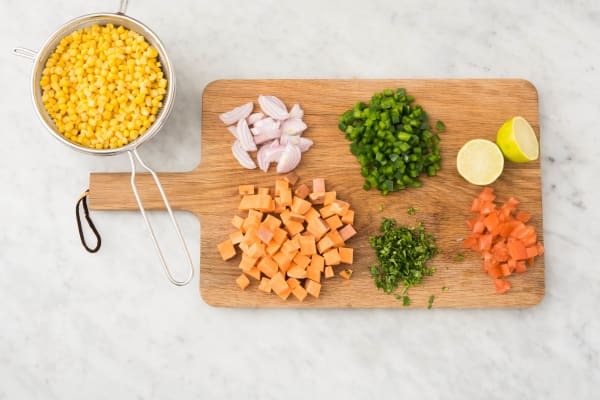 Cut sweet potato into ½-inch cubes. Drain and rinse corn. Core, seed, and dice tomato. Halve and peel shallot, then cut into ½-inch-thick slices. Halve lime. Core, seed, and dice poblano. Finely chop cilantro. 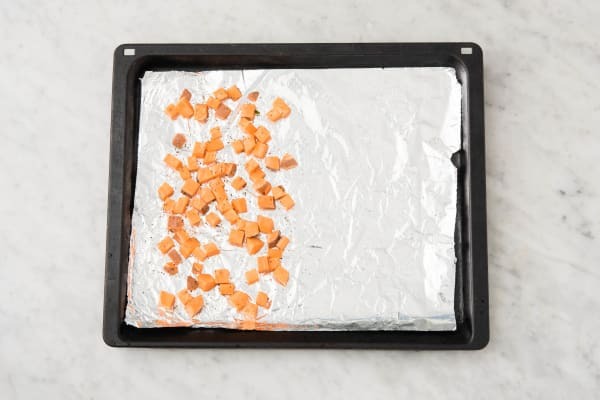 Toss sweet potato with a drizzle of oil, salt, and pepper on one side of a foil-lined baking sheet. Roast in oven for 15 minutes (we’ll add more to the sheet then). Meanwhile, pat chicken dry with a paper towel and season all over with salt and pepper. Heat a drizzle of oil in a large pan over medium-high heat (use a nonstick pan if you have one). Add chicken and cook until skin is crisp, 5-6 minutes per side. Give sweet potato on sheet a toss, then add chicken to same sheet. Roast until sweet potato is tender and chicken is cooked through, about 15 minutes. Add corn and 1 TBSP butter to pan used for chicken over medium-high heat. Cook, stirring occasionally, until lightly charred in spots, 5-8 minutes. 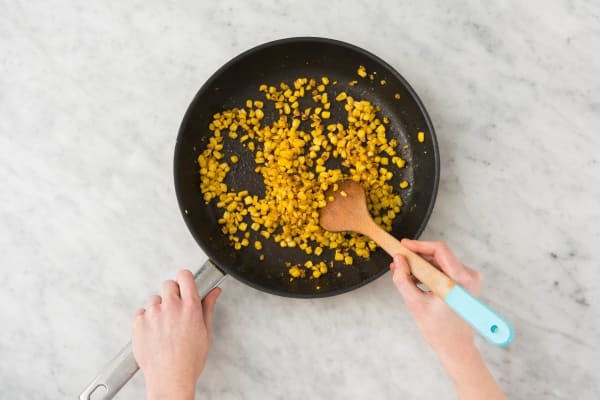 (TIP: If corn pops, cover pan.) Season with salt and pepper. Remove from pan and set aside in a medium bowl. Add poblano, shallot, and a drizzle of oil to same pan over medium-high heat. Cook, stirring often, until slightly blistered, 4-5 minutes. Season with salt and pepper. Set aside in bowl with corn. In a small bowl, stir together barbecue sauce, a squeeze or two of lime, and as much hot honey as you like (start with half and add more to taste). Remove sweet potato from baking sheet once tender and transfer to bowl with veggies. Heat broiler to high. 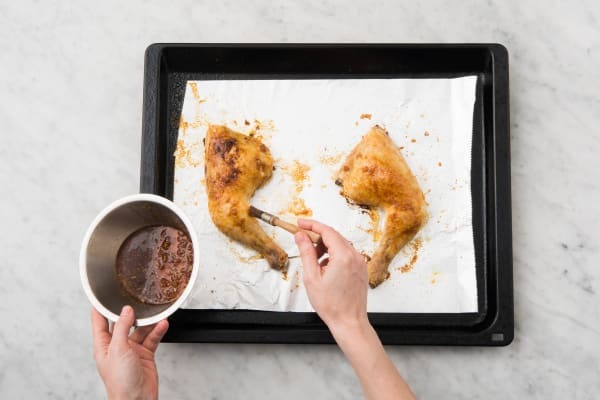 Set aside half the barbecue sauce mixture for serving, then brush chicken with remaining half. Broil until sauce is tacky and beginning to char, about 3 minutes. Toss tomato, cilantro, and a squeeze or two of lime into bowl with veggie mixture. Season with salt and pepper. Divide between plates along with chicken. Serve with reserved sauce on the side for drizzling over.